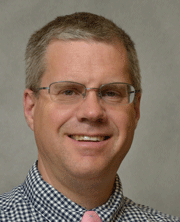 Dr. Erik Peterson joined the division of Rheumatic and Autoimmune Diseases in July, 2002. He is a member of the interdisciplinary Center for Immunology and its Autoimmunity Program, as well as a member of the Cancer Center. He is an immunologist with a scientific interest in those molecules that regulate the development and function of the immune system and prevent or promote the development of autoimmunity. He is also practices general rheumatology and participates in Resident and Fellow teaching. Dr. Erik Peterson has strong interests in the molecular underpinnings of autoimmune diseases, including rheumatoid arthritis, lupus, and myositis. His laboratory utilizes genetic, biochemical, and primary human sample-based approaches to investigating the mechanisms whereby recently identified “risk” genes predispose to development of autoimmune disease. Dr. Peterson's group recently identified a role for Ptpn22, a potent “risk” gene for many autoimmune diseases, in the promotion of toll-like receptor signaling and type 1 interferon production. He is currently investigating the role of Ptpn22 in myeloid cell functions in systemic lupus and in responses to immunization, and is characterizing the molecular mechanism of Ptpn22 promotion of type 1 interferon signals. Investigations carried out in Dr. Erik Peterson’s laboratory aim to increase understanding of the molecular mechanisms behind newly identified risk genes associated with autoimmune diseases. The laboratory uses human peripheral blood, genetically-altered mice, and transformed cell lines to approach questions concerning the biochemical, cellular, and immune response-modulating functions of susceptibility alleles. The PTPN22 gene is among the strongest genetic predisposition factors for major human autoimmune diseases, including type 1 diabetes (T1D), rheumatoid arthritis (RA), and systemic lupus erythematosus (SLE). PTPN22 encodes lymphoid tyrosine phosphatase (Lyp); a Lyp variant bearing a R620W substitution (“LypW”) is causally associated with disease risk. Lyp is a well-known negative regulator of T cell receptor (TCR) signaling, and most functional genomic work to date has focused on the potential mechanisms of LypW variant action on adaptive immune processes. Despite intensive study, a comprehensive model for LypW mechanism(s) of action in autoimmune disease is lacking. In collaboration with others at UMN and elsewhere, our group recently demonstrated that PTPN22 plays a critical positive role in regulating pattern recognition receptor (PRR) signaling leading to production of type 1 Interferons (IFN) by myeloid cells. We established that Lyp protein binds and promotes activation of TNF Receptor Associated Factor 3 (TRAF3) during myeloid cell PRR signaling. Lyp also promotes PRR-induced, type 1 IFN-driven anti-viral host defense and suppression of inflammation in the gut and in the joint lining synovium. Importantly, the LypW variant exhibits reduced-function behavior in PRR signaling and in type 1 IFN-governed suppression of inflammation. Is myeloid cell-intrinsic Lyp function sufficient for major host defense and anti-inflammatory PTPN22 actions in vivo? What is the molecular basis for Lyp promotion of TRAF3 signaling? How does LypW function differently in myeloid cell signaling and type 1 IFN-driven processes in vivo? By experimentally addressing questions such as these, we seek to identify novel therapeutic targets, high-quality biomarkers, and ultimately, the cure for systemic rheumatic diseases. Bottini N and Peterson EJ. 2013. Tyrosine Phosphatase PTPN22: Multifunctional Regulator of Immune Signaling, Development, and Disease. Ann Rev Immunol. In press. Wang Y, Shaked I, Stanford SM, Zhou W, Curtsinger JM, Mikulski Z, Shaheen ZR, Cheng G, Sawatzke K, Campbell AM, Auger JL, Bilgic H, Shoyama FM, Schmeling DO, Balfour HH Jr, Hasegawa K, Chan AC, Corbett JA, Binstadt BA, Mescher MF, Ley K, Bottini N, Peterson, EJ. 2013. The autoimmunity-associated gene PTPN22 potentiates toll-like receptor-driven, type 1 interferon-dependent immunity. Immunity. Jul 25;39(1):111-22. Wen F, Ellingson SM, Kyogoku C, Peterson EJ (corresponding author), Gaffney PM. 2011. Exon 6 variants carried on systemic lupus erythematosus (SLE) risk haplotypes modulate IRF5 function. Autoimmunity, Mar; 44(2): 82-9. Bilgic H, Ytterberg SR, Shreyasee A, McNallan KT, Wilson JC, Koeuth BS, Newman B, Bauer JW, Peterson, EJ. (corresponding author), Baechler EC, Reed AM. 2009. IL-17 and IFN-Regulated Genes and Chemokines Mark Disease Activity in Dermatomyositis. Arthritis and Rheumatism. Nov;60(11):3436-46. Zou L, Mendez F, Martin-Orozco, N, Peterson EJ. 2008. Defective positive selection results in T cell lymphopenia and increased autoimmune diabetes in ADAP deficient BDC2.5-BI/6 mice. Eur J Immunol. 38(4):986-94. Dluzniewska J, Zou L, Harmon IR, Ellingson MT, Peterson EJ. 2007. Immature hematopoietic cells display selective requirements for adhesion and degranulation-promoting adaptor protein in development and homeostasis. Eur J Immunol,; 37(11):3208-19. Mueller KL, Thomas MS, Burbach BJ, Peterson EJ, Shimizu Y. 2007. Adhesion and degranulation-promoting adapter protein (ADAP) positively regulates T cell sensitivity to antigen and T cell survival. J Immunol. 15;179(6):3559-69. Medeiros RB, Burbach BJ, Mueller KL, Srivastava R, Moon JJ, Highfill S, Peterson EJ, Shimizu Y. 2007. Regulation of NF-kappaB activation in T cells via association of the adapter proteins ADAP and CARMA1. Science,; 316(5825):754-8. Stoeckman, A, Baechler, E., Ortmann, W., Behrens T., Michet, C., Peterson EJ. 2006. A distinct inflammatory gene expression profile in patients with psoriatic arthritis, Genes Immun., 7(7): 583-91. Wu JN, Gheith S, Bezman NA, Liu QH, Fostel LV, Swanson AM, Freedman BD, Koretzky GA, Peterson EJ. 2006. Adhesion- and degranulation-promoting adapter protein is required for efficient thymocyte development and selection. J Immunol. 176(11):6681-9.